Cut paneer into cubical shapes and keep aside. Cut tomato and onion into 4 pieces and boil till it done and grind to make puree. Heata nonstick pan, add oil OR ghee, cinnamon and chopped ginger. Thereafter cook it until it becomes brown. Add ginger garlic paste and cook it until it releases its oil. Now add onion tomato puree and fry it until it's half done. Add coriander powder, cumin powder, red chili powder and salt. And also fry it until it releases its oil in medium flame. Now add fresh cream and cook it foe 1-2 min at low flame. 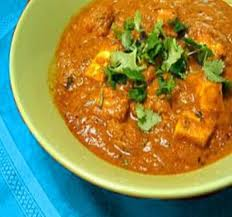 Add paneer, garam masala and kitchen king and cook it for 2-3 min. Add 1 cup of water and cover the pan, cook it for 5-7 min at low flame. Garnish it wiith corriander leaves. It can be served with tandoori roti or naan.